Imagine you are the center of an analog clock, and one of your legs will be the minute hand. Start with your right foot, and lunge to twelve o’clock, then come back to the center. Continue using your right leg to lunge to every number around the clock (except fo r 9 o’clock). Your right leg will back “curtsy” at 8 o’clock, and front “curtsy” at 10. Enjoy feeling your right leg move in all the planes it is meant to be strong in (thank you ball and socket hip!) Now repeat on the left leg, lunging first to 12 o’clock, the around the clock again, reverse if it feels more natural. This time, your left leg will skip lunging at 3 o’clock. Now that your legs “know” the clock, if you have a teenager or a tween, clock lunge together, taking turns calling out numbers. Time yourself and see if you can go for longer each round. If you or your teen are athletic, do this with your eyes closed and/or as jump lunges!Watch that your body weight is in your glutes and quads, not knees, all while keeping your core actively engaged. With a younger child, write 1-12 on 12 pieces of paper, tape them to the floor, and teach your child the clock while getting super strong together. 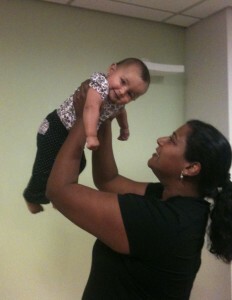 If you have a baby, hold them in a carrier and do the same activity, all while singing “Hickory Dickory Dock”. Ok, you don’t have to sing, but if you do, you’ll be breathing properly, and your baby will love it. If you or your child play a sport that has quick changes of direction like soccer or tennis, notice how doing these lunges regularly improves your strength and reaction time. If you don’t play a sport, feel good knowing that doing these clock lunges will increase your metabolism (thanks big muscle groups), as well as the time your lower body is injury free. There are a few ways to play this game depending on the age of the players. Think charades, but writing words or pictures with your body. 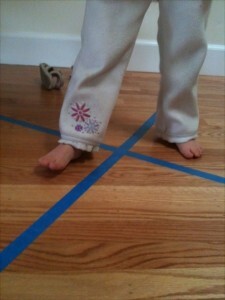 Warm up by writing words with your ankles, knees, and whole leg, on both sides. Then write the word or picture with your whole arm, then bend at your waist and attempt to draw the picture as if a marker was on your head, and the paper was in front of you. You are now ready to play the game. If you have a young child, repeat above, changing the picture or letters your write together. Notice how differently they look and feel when you write them with your arm compared to your body. With an older child, form teams and compete against each other and the clock. You can pick a topic (animals) or agree it’s only words or pictures you are drawing. Then pick how you are drawing it. If your arm is drawing a picture cow, it is different than if your leg has to write out the word “cow” (nearly impossible). The best way to play is to make it full body and have a high impact charades game. If you have a teen and the hilarity of charades has worn off, try blindfolding the person who is acting it out. The difference in this game of charades is that the opposite team is NOT sitting on the couch trying to guess. During the time they are guessing and the sand timer is flowing, the opposite team is doing jumping jacks, squats, or whatever else they opponent have chosen for them. Alternatively, create two stacks of cards. 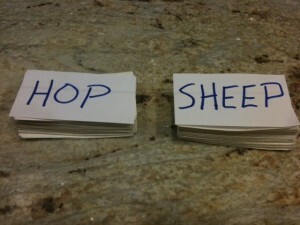 One stack has the words that will be drawn/acted out with your body, the other stack has the activity words. Both teams pick one card from a pile each round, then switch. Play until your sides hurt from laughing and you can’t stand up anymore. It’s raining for the fifth day in a row and you are stuck in side starting to go stir crazy. You’ve jumped on the bed, jumped on the couch, baked everything you can think of and taken away the markers after they were used on the cat. What now? Put an “X” on the floor with tape or pillows. Now step around it, run it around and jump in the middle. Put each foot in a different quadrant and switch ‘em. Fast. Turn 180 and 360 degrees landing with each foot in a different section, but don’t touch the tape. Cross your feet, and jump open to the same and/or different angles. Hop on one foot, then the other, in every way you can think of around the X. Front to back, side to side, in a circle, counter clockwise, diagonally and on the lines. Kneel down on all fours and repeat above. Or try it all in a plank position. Multiple kids? Have a competition for who can think of the most ways to move around the X and who can do it for the longest time. Make many tape X’s, or X’s out of different materials (rolled towels, pillows, etc.) so the jumper has to be quick on their feet over different heights. Can you move from X to X? How many different ways? Think of it as a puzzle for your feet. Have a baby? Hold them and carefully move your feet, or have them copy you if they are toddling. From three to adult, this game is good for cardiovascular conditioning, balance, and kinesthetic awareness, besides all the other health benefits exercise brings. Don’t stop indoors. Once it’s sunny, look at the sidewalk. Almost all sidewalks have X’s, and when all the neighborhood is out solving the X puzzle with their feet, it’s a healthy, happy ‘hood. Put on your hoodie and break dance! Tie a bandanna around your neck and hoedown! Take off your shoes and slide around the floor with socks doing the twist! Break out the disco ball or flashlights! Use the back of the couch or kitchen chair as a ballet barre! Put spoons in your hands and pretend to Flamenco! Play loud air guitar and rock-n-roll! Put bubble wrap on the floor and “tap” dance on it! Seems really obvious, but so many families forget the easiest exercise is the one right in front of them. All movement counts and adds up quickly! Choose music you like and hold your small child and dance together. With 3-7 year olds, play freeze dance. Choose music your tween likes and let them teach you how to shake it. Make a dance video together. Take your teen to dance class with you- Zumba, Jazzercise, Ballroom, Drums Alive, etc., and dance together. Many community centers have inexpensive classes. Can’t get to class because of work and school? Rent a dance video from the library. All kids will burn up the floor if encouraged. Turn off the lights, turn up the volume, and cut a rug together. Do it when you are tired or have had a bad day and watch the power of movement transform you. Want a little inspiration to start? Watch Michelle Obama and Jimmy Fallon shaking it “to encourage parents everywhere to get up and get moving with their kids”. 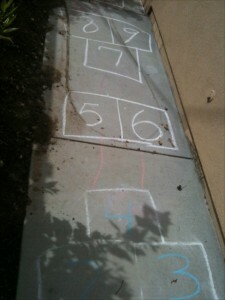 Yeah, yeah, everyone knows hopscotch. But when was the last time you really played it hard? I mean laid out tape on your living room floor or chalked the sidewalk up and went at it. Not just regular one hop, two foot jumps, but speed hopscotch. Frontwards, backwards, sideways-first right and then left. When was the last time you raced the clock for a set of ten to see if you sped up or slowed down by the tenth time? Did you sprint around the outside boxes while your child was hopping? How many times can you run around it while the other person goes? Did you slow way down and do moving planks through the hopscotch game, lifting one foot or one hand on the single spaces? If you have a small child, give them a ride. Race a tween, and add math games in. Whoever adds up their numbers and gets to 50 first wins. Or 100 if multiplying. Older kids can jump with one eye closed. Or turn the board into a long jump hopscotch. Or obstacle course hopscotch with a bigger board and big obstacles in the way, like a sister doing push-ups or a brother holding a wide stance squat you have to crawl through. Try it zigzag, or equate each number with an activity. If your rock, sock, bean bag, (whatever your place holder is) lands on “1”, you have to do one full 360 degree jump turn. Block lands on “2”, welcome to two burpees. If your place holder lands on “3”, it’s free choice and everyone has to do it. Etc. Try it and watch your balance, proprioreception, eye hand coordination and cardiovascular stamina increase. Oh, and you’ll have a blast too.